Here is another quick and easy prawn dish that I always like to cook at home. 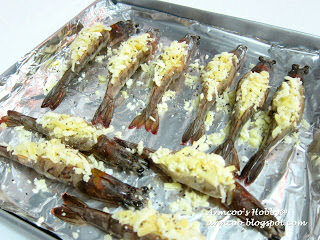 You can serve this baked cheese prawns as main dish with rice or as side dish with salad and dressing. 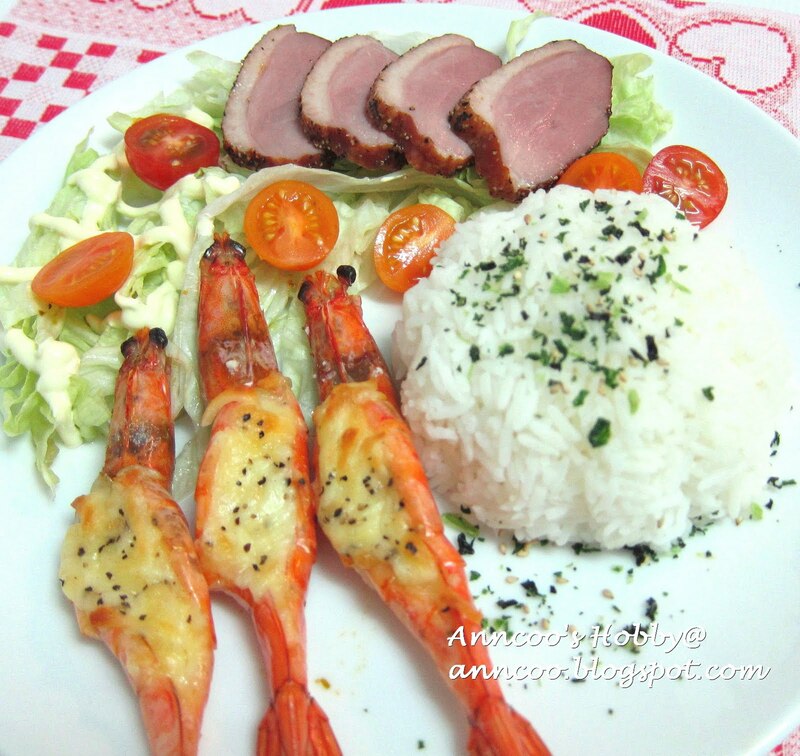 In my main dish, I served baked cheese prawns with rice, smoked duck (store bought) and tomatoes, lettuce with mayo. I also sprinkled some Japanese mixed seaweed over the rice. With a small knife make a small slit down the centre of the curved back of the prawns. Remove the black vein, rinse the prawns and dry gently with kitchen paper. Line baking tray with aluminium foil and place prawns on it. Sprinkle some salt on prawns, add butter, chopped garlic, shredded mozzarella cheese and black pepper on top of prawns. Bake at 180C for 10-12 mins or till just cooked. These look divine. I am having trouble with the graphics on your new blog though. I think it's too much data for my prehistoric computer! Wiffy: hehee…next time I will add some mayo in it too. Thank you! Ann.. You're so really creative in your cooking. I always run out of idea on what to cook sometimes. Bet my hubby will like this. 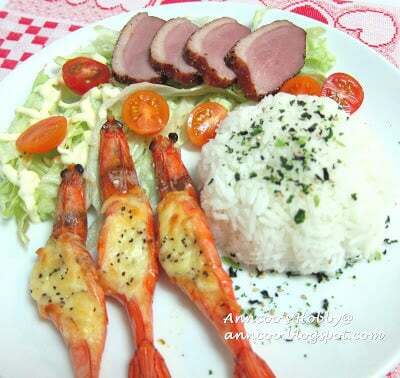 Ann, the prawns look so delicious and congrats on the awards. Thank you Shandy for your nice comment. Malar: Thank you very much. Sophia: Thank you very much for your compliment! Holy cow! Those look and sound amazing! You make everything So good! Cheesy, hot, crunchy…mmm! Looks like you've been eating well at home. wow this dish looked so delicious, yet such minimal ingredients wow you are a fantastic cook! 🙂 Wish I can cook like you! The prawns stuffed with cheese look amazing! I love shrimps! This is a really fun delicious dish to serve! I will be putting this one on our menu, thanks!It looks delicious. Delicious cheese prawns, love them all the time. Congrats for the awards! The shrimps look so delicious with the mozzarealla cheese stuffing. Best of all, it is baked…super easy and tasty! wow, what an amazing idea! Little Inbox: I'm sure you'll love this after trying it. Thank you JO! So nice to have you here and you are my friend too! My Asian Kitchen: Thanks for your lovely comment. Patty: Thank you for your compliment. Besides cheese, there are other ingredients we can add too! Fimere: Thanks for your compliment. Joy: You'll love this dish after trying it. Congrats for your awards and for your delicious baked cheesy prawns! This might be a great idea fo our cooking club. Thanks Anncoo. wow!! cheesy prawn!look so scrumptious!! I can whack the whole plate myself..lol! Ann, this looks so, so good – just like restaurant style. I would be any seafood lover's favourite as well. BTW it was really sweet of you to send the parcel to Mary. I'm a prawn lover too. Will definitely try this out! Such beautiful presentation! The prawns look absolutely fantastic. I love prawns. I have to this this the next time I make prawns. crevettes et fromage ça me parait extrêmement délicieux!!! platter looks very good…great clocks!! WOW! I have NEVER seen prawns like this before! It never occurred to me that you could stuff prawns, especially with something as delicious as CHEESE! Wow, these are amazing! You are so talented. Thank you for sharing your recipes with us! Lyndsey: Yes, this is really delicious. Thanks Lazaro for your sweet compliments. The prawns look so tempting, and I can wallop the whole plate all by myself! Pretty awards from Marymoh too! What a feast! I can easily tell these prawns are giants! Congrats on the well deserved awards. I have really enjoyed reading your blog. You do a wonderful job. What a great looking prawn dish. Love the presentation. Lovely dish, prawns with cheese on top! Looks great! You're welcomed Mary! So happy that you love those little gifts.